Following World War I, the American Battle Monuments Commission (ABMC) was established to enhance the overseas military cemeteries for the fallen and to erect memorials to the combat accomplishments of the American Expeditionary Forces (AEF). In 1925 ABMC retained Paul Philippe Cret as their consulting architect. He subsequently guided every aspect of their ambitious construction program, including designing the permanent headstones used for overseas American burials. 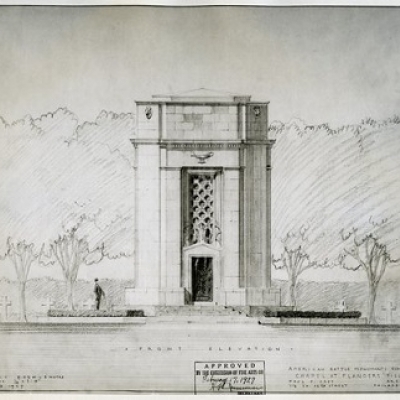 This illustrated lecture will examine Cret’s crucial role in overseas military cemetery design after World War I as well as ABMC’s monument building program. Trained as an architect and architectural historian at the University of New Mexico and the University of Pennsylvania, Whitaker primarily works on documenting and interpreting Penn’s design collections, including holdings related to the of life and work of architect Louis I. Kahn and landscape architect Lawrence Halprin, as well as that of the husband and wife design team of Robert Venturi and Denise Scott Brown. He has lectured on a wide range of subjects related to twentieth century architecture, landscape, and community design in the greater Philadelphia region, to audiences in the United States, Canada, Germany and India. Whitaker has co-authored: The Houses of Louis I. Kahn (Yale University Press, 2013) with George Marcus, the first comprehensive study of the architect’s house designs, and is also a co-editor of Crafting a Modern World: The Architecture and Design of Antonin and Noemi Raymond (Princeton Architectural Press, 2006) with Kurt Helfrich.